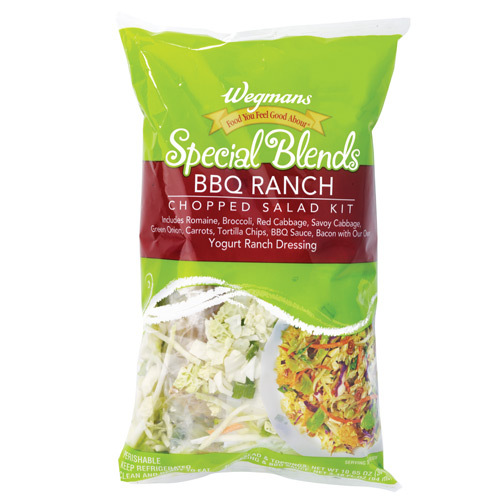 The kit comes with Romaine lettuce, broccoli, cabbage, green onion, and carrots; it also includes a package of tortilla chips, a package of bacon bits, a packet of BBQ sauce, and a packet of ranch dressing. The vegetables were all cut up in tiny pieces, which made it easy to mix with the dressing. The salad has a lot of textures with the crisp vegetables, crunchy tortilla chips, and creamy dressing. It comes with bacon bits! At $2.99, I felt like this was a good value. The kit made 2 entree sized salads once I added protein (see Con) and a slice of bread. The kit does not contain any significant source of protein. I added a few slices of turkey to make this an entree. The toppings were wrapped in packages that were mixed in with the vegetables, so I had to use my hand to fish them out. The salads are fresh which is great, but that also means the “Use By” date was just 2 days after purchase. Bottom Line: I would buy it again to use as a meal on a busy weeknight. And it kind of inspired me to try to make my own version.